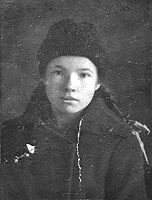 My grandmother Anni Hänninen (Honkonen in girlhood), was born on June 4 (on May 22 on Old Style) 1908 in Vanha Alakylä village on Rajajoki river, on Russian side of border of the Finnish Autonomous Grand Duchy. Her father Antti, in memory of which I am named, was the native of these land. The son of a rich peasant, Antti got married to poor girl Helena Kouhio against his parents will. They had four children. There was the elder son Juho. Following was born son Vilho. Then – daughter Anni and daughter Helmi. Honkonens kept a usual peasant house. Delivered milk to one of St.-Petersburg shops. Sometimes father took a little Anni with himself to city. Events of 1917-1918 years had for ever destroyed usual style of family's life The brother Vilho had left for war and had died on war from typhus. The house keeping was completely ruined, the property was plundered. In 1918 together with retreating White Army Honkonens had passed to the Finland side of Rajajoki river. 1980 Originally the refugees were placed in the camp of a Red Cross. America helped over by foods. Family was offered to leave to USA, promised a plot of land on Far West, cows and loan. However father had refused with words: "Here is my Native Land. Here I was born, here I will die." Then the family was settled in Kellomäki. Had rented an apartment. Sister Helmi was born there. Anni had studied a program of an elementary school in public school. The names Uusikirkko and Kanneljärvi are mentioned in the further family history. Anni grown up and began to work. At first – as servant. In the further – on a factory. However, beginning in 1929 economic crisis reduced the welfare of family. By 1931 the unemployment in Finland had reached a maximum. There was no money for life. In 1932, having maintained of difficulties, Anni, her parents and a little sister Helmi came to Soviet Union in search of the best life. The brother Juho was stayid in Finland. They hoped to return to native places, to Vanha Alakylä village, however were surraunded moved to north, whence have managed to go back only seven years ago. My father was born exactly there, in Narjan-Mar. Till 1941 lived in Kondopoga. After beginning of war were evacuated to Vologda area. There, on village cemetery, Anni had buried a mother and a father (he was not succeed to die on his Native Land). After war she was settled with a son and a sister in Petrozavodsk. Worked. Had left on pension. Brought up a grandson – me. 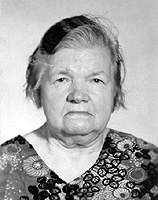 She died on August 15, 1983 in Petrozavodsk. Was buried in the Besovets Cemetery (near Petrozavodsk).